It’s a pretty bold step for MAC, but one I will gladly support. Frequently if you are a woman and “too fat” or “too thin” you are subjected to a constant invasion of privacy by people who cite your inattention or “lack of caring” of your body as a hazard to your health. And yet, when we are presented with women such as Abbou-truly a strong and beautiful female-people are just as equally repulsed. I have long thought that girls should have more focus spent on intense physical fitness from a young age. I wish I had been forced into working harder in gym class. I lament my lack of muscles now (but I’m working on getting some, seriously my lack of upper body strength sometimes makes me cry). 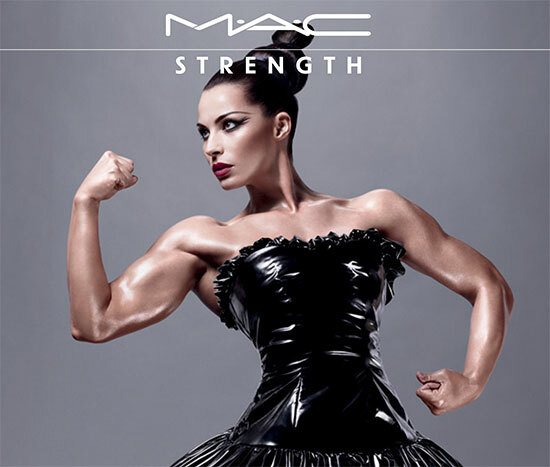 I love the way Jelena looks and I love that the makeup campaign is embracing her muscles instead of trying to make her look more traditionally feminine. You can say what you want about cosmetic companies, but I have always admired MAC’s ability to showcase and give back. They were one of the first companies in the cosmetic field to sell a product (their Viva Glam line) and donate 100% of the proceeds to help aid those living with or affected by HIV/Aids. I’m so glad that they have chosen to take this kind of approach with this collection. I get tired of seeing the same bland model in everything I look at–thin (most of the time too thin, usually because of air brushing), straight hair, nothing unique about her face etc. In fact half the time companies are just taking the same body and with some photo shop magic adding different heads and adjusting the skin tone so you are in fact constantly looking at the same model. I want to see more women like Jelena Abbou featured more often and in even bigger venues. I want to see more diversity, more skin tones, more body shapes and sizes. I want the presentation of women in the media to actually reflect what most women in reality actually look like. Hey a girl can dream right?